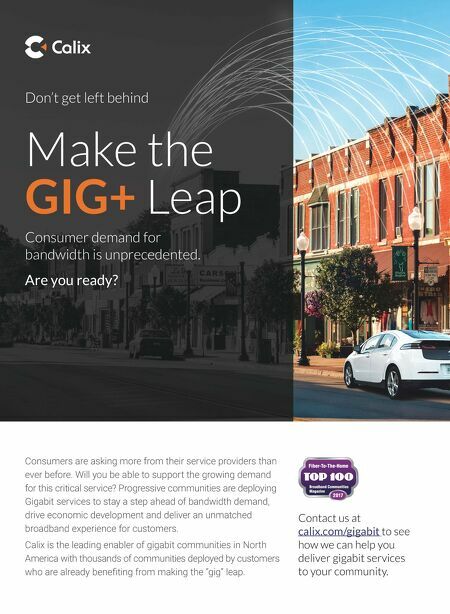 14 | BROADBAND COMMUNITIES | www.broadbandcommunities.com | NOVEMBER/DECEMBER 2017 NEW WORLD OF VIDEO Too Many TV Choices? 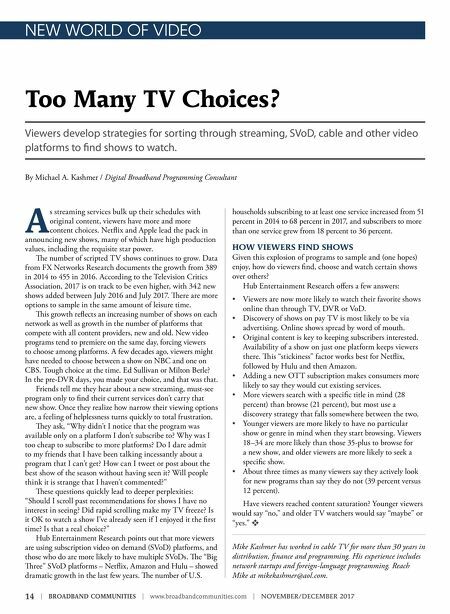 Viewers develop strategies for sorting through streaming, SVoD, cable and other video platforms to find shows to watch. By Michael A. Kashmer / Digital Broadband Programming Consultant A s streaming services bulk up their schedules with original content, viewers have more and more content choices. Netflix and Apple lead the pack in announcing new shows, many of which have high production values, including the requisite star power. e number of scripted TV shows continues to grow. Data from FX Networks Research documents the growth from 389 in 2014 to 455 in 2016. According to the Television Critics Association, 2017 is on track to be even higher, with 342 new shows added between July 2016 and July 2017. ere are more options to sample in the same amount of leisure time. is growth reflects an increasing number of shows on each network as well as growth in the number of platforms that compete with all content providers, new and old. New video programs tend to premiere on the same day, forcing viewers to choose among platforms. A few decades ago, viewers might have needed to choose between a show on NBC and one on CBS. Tough choice at the time. Ed Sullivan or Milton Berle? In the pre-DVR days, you made your choice, and that was that. Friends tell me they hear about a new streaming, must-see program only to find their current services don't carry that new show. Once they realize how narrow their viewing options are, a feeling of helplessness turns quickly to total frustration. ey ask, "Why didn't I notice that the program was available only on a platform I don't subscribe to? Why was I too cheap to subscribe to more platforms? Do I dare admit to my friends that I have been talking incessantly about a program that I can't get? How can I tweet or post about the best show of the season without having seen it? Will people think it is strange that I haven't commented?" ese questions quickly lead to deeper perplexities: "Should I scroll past recommendations for shows I have no interest in seeing? Did rapid scrolling make my TV freeze? Is it OK to watch a show I've already seen if I enjoyed it the first time? Is that a real choice?" Hub Entertainment Research points out that more viewers are using subscription video on demand (SVoD) platforms, and those who do are more likely to have multiple SVoDs. e "Big ree" SVoD platforms – Netflix, Amazon and Hulu – showed dramatic growth in the last few years. e number of U.S. households subscribing to at least one service increased from 51 percent in 2014 to 68 percent in 2017, and subscribers to more than one service grew from 18 percent to 36 percent. HOW VIEWERS FIND SHOWS Given this explosion of programs to sample and (one hopes) enjoy, how do viewers find, choose and watch certain shows over others? Hub Entertainment Research offers a few answers: • Viewers are now more likely to watch their favorite shows online than through TV, DVR or VoD. • Discovery of shows on pay TV is most likely to be via advertising. Online shows spread by word of mouth. • Original content is key to keeping subscribers interested. Availability of a show on just one platform keeps viewers there. is "stickiness" factor works best for Netflix, followed by Hulu and then Amazon. • Adding a new OTT subscription makes consumers more likely to say they would cut existing services. • More viewers search with a specific title in mind (28 percent) than browse (21 percent), but most use a discovery strategy that falls somewhere between the two. • Younger viewers are more likely to have no particular show or genre in mind when they start browsing. Viewers 18–34 are more likely than those 35-plus to browse for a new show, and older viewers are more likely to seek a specific show. • About three times as many viewers say they actively look for new programs than say they do not (39 percent versus 12 percent). Have viewers reached content saturation? Younger viewers would say "no," and older TV watchers would say "maybe" or "yes." v Mike Kashmer has worked in cable TV for more than 30 years in distribution, finance and programming. His experience includes network startups and foreign-language programming. Reach Mike at mikekashmer@aol.com.